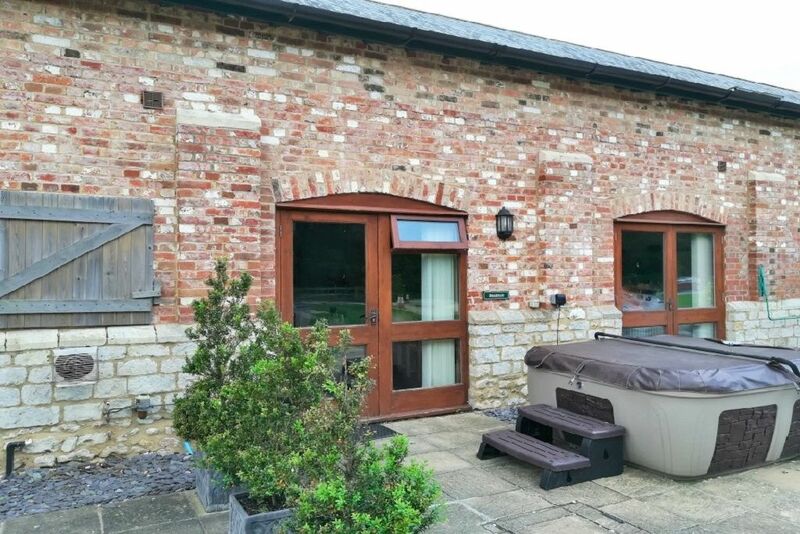 Beatrice House is a magnificent, spacious property situated on the east side of The Victorian Barn. The property benefits from 4 en-suite bedrooms, sleeping up to 10 guests as follows, 2 king bedrooms, 1 king bedroom with additional single bed and 1 triple bedroom with 3 single beds. All bedrooms benefit from wall mounted flat screen TV's and fitted wardrobes & two of the bedrooms have quirky ceilings and Velux windows. The ground floor boasts an enormous open plan lounge with wall mounted flat screen TV, large comfortable leather sofas and bucket style chairs plus coffee tables. The dining area has a vast wooden dining table with Oak leather chairs for 10 guests. There is also a ground floor WC for guest’s convenience. The fully fitted kitchen includes a dishwasher and has a tiled floor. Beatrice House is perfect for socialising for families or groups of friends for holidays, celebrations or for a relaxing countryside retreat. We are pleased to be able to offer superb shared onsite leisure facilities, open all year round. All linen and towels provided for up to 10 guests. This includes 2 pillows per person and a duvet, plus white cotton linen & 1 hand and 1 bath towels per person. Very spacious lounge with 4 large comfortable leather sofas plus 40 inch flat screen TV. There are also coffee tables and soft wall lighting, welcome pack & attractions leaflets. Plenty of pots & pans, crockery, cutlery and glasses for 10 guests. Fully fitted country style kitchen, contains dishwasher, fridge & freezer, toaster, kettle, pots and pans. Iron & Ironing board as well as cleaning equipment. Patio area, just outside the property with garden furniture, perfect for BBQ's and enjoying country living. Not enclosed. 'Quiet time' between 11 pm and 8 am. Outside hot tub for your sole use and enjoyment. Hours of use 8 am - 11 pm. We also have 3 Coarse fishing lakes available to fish or just to enjoy for a nice walk. Lovely spacious property and facilities, great for families! The photos don't really show the spacious nature of the property and grounds. We were two families staying together in the Beatrice House property, including 3 boys and a baby and there was plenty of space in the open plan downstairs for them to run around and not feel like we were on top of each other. All the bedrooms are a really good size and we loved that they all had their own bathrooms. Loved having a pool and gym on site and the kids loved the play area. Well kept property and well stocked kitchen. Lovely, spacious grounds and you really felt you were in the country and away for it all. We will definitely be back! Thank you for taking the time to write a review on your recent stay with us at The Victorian Barn. We look forward to welcoming you all back in the future. Soft play centre just 3/4 miles away and the Jurassic coast is only 30 minutes drive.